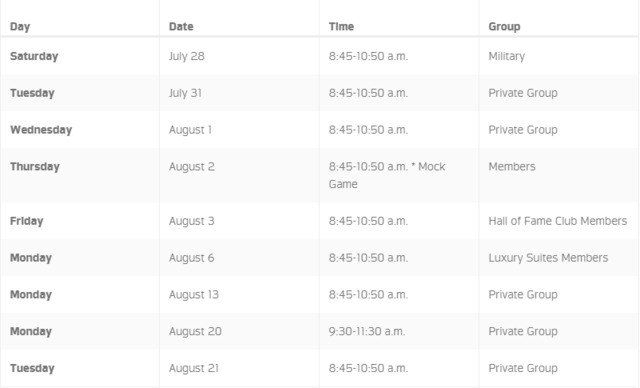 TAMPA — The Tampa Bay Buccaneers have released their 2018 training camp schedule. Training camp includes six practices that will be open to the public, five of which will be held on the weekend to accommodate more fans. Tickets are free and can be reserved here . #Bucs just announced their training camp schedule. This year, fans will be able to roam the perimeter of all three fields at One Buc Place, allowing them to get closer to the drills and position groups they are most interested in. At select practices, the team will move into the indoor facility for the second half of their two-hour workout. Fans will be able to see that portion of practice as well, but cannot bring chairs inside for safety reasons. "We are excited about the unprecedented level of access that our fans will enjoy as they get even closer to the action this year at training camp. The new, air-conditioned indoor practice facility will provide a comfortable viewing experience and create an unmatched atmosphere for those practices open to the general public," said Buccaneers Chief Operating Officer Brian Ford. "We are always focused on providing memorable experiences for our fans and this year’s training camp offerings will be one of the most entertaining to date." Parking at One Buccaneer Place is free for fans and will open an hour before the start of each practice. Gates to the fields will open 30 minutes before start time.